Looking at a map of Maine, you can see that the State of Maine is bounded by the Canadian Province of New Brunswick on the northeast and by the Atlantic Ocean on the southeast. It is bordered by the Canadian Province of Quebec on the northwest and by New Hampshire on the southwest. Maine is the 39th largest state in the United States, and its land area is 30,862 square miles (79,933 square kilometers). The state is divided into 16 counties. This Maine map site features road maps, topographical maps, and relief maps of Maine. The detailed, scrollable road map displays Maine counties, cities, and towns as well as Interstate, U.S., and Maine state highways. The pannable, scalable Maine street map can be zoomed in to show local streets and detailed imagery. to view a scalable Maine road map. The detailed Maine map and the regional Maine map display cities, roads, rivers, and lakes as well as terrain features. The detailed map shows only the State of Maine, while the regional map shows Maine and the surrounding region. Maine's capital city is Augusta. Other major cities found on the Maine map include Portland, Lewiston and Bangor. In 2005, the population of Maine was estimated at 1,318,220, which is about 42.8 people per square mile. In 2010, Maine's population rose to 1,328,361 people. The state's Interstate Highways include I-95 and I-295. Maine may have been named for the former French province of Maine or used to distinguish the mainland from its adjoining offshore islands. Much of Maine's landscape is rolling country, with the thickly forested Longfellow Mountains in the west. More than 2,000 lakes dot the landscape, and rivers such as the Saint John, Penobscot, and Kennebec drain the state. Tourists from other New England states and the Mid-Atlantic states visit Maine for the natural beauty of its lakes and coastline, most notably Acadia National Park. For Maine travel and tourism information, visit the official Maine tourism site and Maine Atlas. This online Maine reference map shows major cities, roads, railroads, and physical features in Maine. 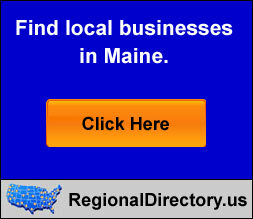 Several map publishing companies offer printed maps of Maine. For example, Omni Resources offers several maps of Maine that feature points of interest, airports, and parks, as well as selected local attractions and insets of major Maine cities. Maine-Map.org Editor, State Maps, PO Box 775, Barnegat, NJ 08005.